Every Android device has the ability to take a screenshot, which is basically a copy of the screen in a moment that you choose. In the Galaxy Note 8.0 you have more options to take a screenshot. You can either take one by using the S Pen, or you can use the key combination. You choose the one that you find more efficient. With the screen turned on, press Power button and Volume button simultaneously. Hold them for one or two seconds and wait for the screenshot to appear on the screen. 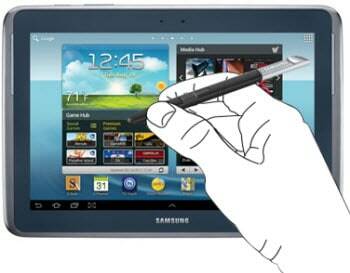 With the device’s screen turned on, hold the S Pen in your hand and over the screen. Press the side button on the S Pen and hold it for a few seconds. Wait for the capture noise to confirm that the screenshot was taken. You will also see the screenshot on your screen.